Charleston, South Carolina city founded in 1670 the most beautiful historic holy city in the US. Being a wedding photographer here is a blessing, so many variety of scenery and a wealth of the low country. Defined by its cobblestone streets, horse-drawn carriages and pastel pre-Civil-War-era houses, including French Quarter. The Battery promenade and Waterfront Park both overlook Charleston Harbor, overlooking Fort Sumter, from the Civil War that lies across the water.Travel + leisure have voted Charleston the No. 1 City in the World! Charleston SC earned the coveted No. 1 City in the World ranking. We are also the 2nd largest destination wedding on the east coast. 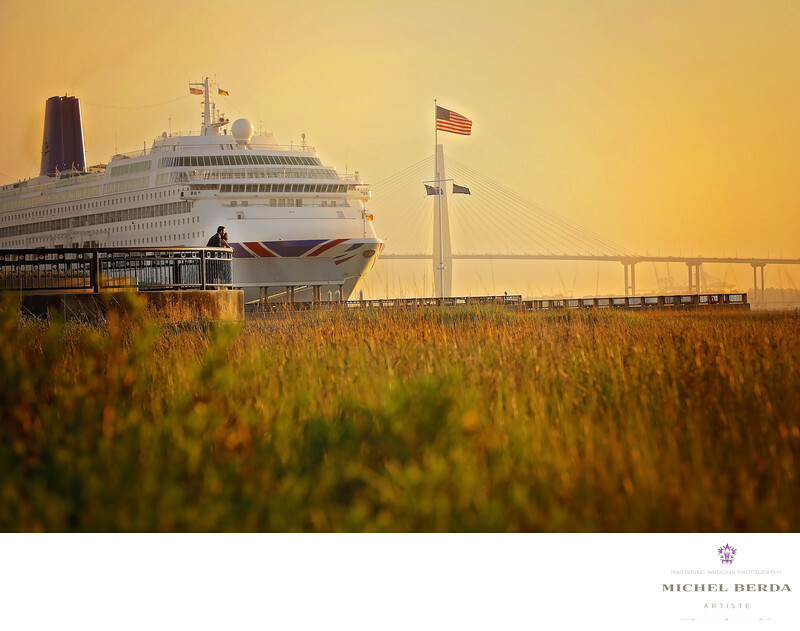 Many of the cruise industry have come to Charleston, Sc, such as Carnival Fantasy, and American Cruises & Royal Caribbean international. I was very fortunate to have a early morning engagement session for my couple, and we could not of asked for a better morning,and sunrise. As you can see on this image I made very sure to include many of the beautiful quality of our hold city by including the famous Ravenel bridge, and the marsh the big cruise ship, the couple who are just bright enough to make this a quality artistic image. Keywords: Charleston (1179), Charleston Sc (27), cruise lines (3), Holi City (3), low country (3), Michel Berda (1140), photographer (1125), travel lesisure (3), waterfront park (6), wedding Charleston sc photographer (3), Wedding Photographer (1254), Wedding Photographers (198).